There are people who just have to live close to nature. Hikers, climbers, skiers, surfers, frequent beach goers - they all need to stay connected with nature. There are also people who enjoy life in the city, but feel the need to get away once in a while. Basically, everyone feels connected with nature and needs to break free from everyday life and city's hustle and bustle every now and then. Fortunately, there are loads of natural wonders which offer beautiful landscape, fresh air and tranquility, where we can restore our energy and find inner balance. Many of such must-see places are located in Europe, and are perfect both for slow holidays and active road trips. I have gathered some of my blogging friends to give recommendations on their favorite spots. Connemara is a beautiful area on the West coast of County Galway, in Ireland. Known for its natural beauty, it’s part of the Wild Atlantic Way and also one of the most beautiful places in Europe if you’re planning a road trip. With a mix of raw coastline, mountains, fairytale villages and castles, the Connemara Loop is the one place to add to your bucket list if you plan to spend a few days in Ireland. The best way to enjoy this road trip is by starting in Galway, a cute, tiny city packed with restaurants and Irish pubs. One of the first spots you will find on the road is the Quiet Man Bridge, famous because it was the set of a 1950 movie starring John Wayne and Maureen O’Hara. As you keep driving, you will arrive at Maam Cross. One of the most famous photography spots in Ireland! Many photographers love this area because it’s full of bog, moorland, lakes and mountains. If you want to hike at Maam Cross bring along your camera. Another highlight on the Connemara loop is the Sky Road. This narrow, amazing road is only for the brave ones: it overlooks Clifden bay and its offshore islands. There’s also the chance to hike to the top of Monument Hill, to find a stone memorial to the man who founded Clifden: John D’Arcy. The lovers of history won’t be disappointed. Your road trip will in fact drive you to Letterfrack, a tiny village where Guglielmo Marconi installed the transatlantic wireless receiver for his first transmission service, and Kylemore Abbey. A visit to this Neo-Gothic castle is absolutely mandatory. Not only it’s one of the most popular attractions in Connemara but also has an amazing walled garden among the most beautiful in Europe! One of the last stops on the Connemara loop is the Killary Fjord, one of the three glacier fjords in Ireland, where you can see a number of protected birds. If you’re very lucky, you might also see the otters that breed in the area! Even though the Southern Coast of Iceland is one of the most popular tourist destinations in Iceland, it’s also some of the most beautiful due to its many amazing waterfalls and gorgeous landscapes. Many of these photogenic spots are only steps away from the Ring Road and don’t require a long hike or trek at all! If waterfalls are your jam, be sure to check out Skógafoss for a beautiful rainbow appearing across the center. Sometimes there are even double rainbows! For a waterfall you can walk behind, hike around the back of Seljalandsfoss. Right next to it is the Gljúfrabúi, a gorgeous waterfall in a cave. Love geometric forms? Make sure you see Svartifoss, where the water drops between basalt columns on either side. Wanna see even more basalt columns? There are entire cliff sides filled with them on Reynisfjara Beach. From there, you can also check out the sea stacks just off the coast. Dyrhólaey, located nearby, has beautiful cliffs and puffins also nest there in the spring and summer months. If you didn’t actually see ice in Iceland, then did you really go to Iceland? Iceland is full of glaciers and ice, especially along the South Coast. Jökulsárlón Glacier Lagoon is an insanely beautiful body of water and is full of floating glacial icebergs. The black sands of Diamond Beach make an amazing contrast against the bright whites and blues of the glacial ice that’s washed ashore. You can also hike on Svínafellsjökull glacier while you’re in the area! There is so much to see along the Southern Coast, you won’t regret visiting for some of the most amazing views and beautiful natural landscapes in Iceland! One of my favorite national parks in Germany is called the Saechsische Schweiz or Saxon Switzerland, named after that country's idyllic mountains. This National Park is located only about 60 minutes from the city of Dresden on one side and the Czech border on the other. The scenery is spectacular as paths and trails wander among humongous limestone pillars. One of its most famous sights is the photogenic Bastei Bridge, which is a popular day hike in the area. Another popular activity is taking a boat ride on the Elbe River to view the limestone rock formations from below. Other parts of the park are good for bicycling, camping, or even bird watching. Every season offers different angles and views of the incredible landscape, but no matter what time of year, my advice is to make sure you are there for the sunset. The other-worldly landscape really comes alive during the evening hours. If you want to experience the amazing nature of this one-of-a-kind park, don't miss out and head to the Saxon Switzerland area of Germany. If you are an outdoors enthusiast visiting southern Spain, consider a visit to the Alpujarras. A hilly area on the southern slopes of the Sierra Nevada, the Alpujarras refers to the natural and historical region. The hilly region is dotted with several small picturesque villages, which are a delight to explore. The hillsides have been terraced and olives, fruit, and vegetables have been cultivated here for centuries. What can you do in the Alpujarras? You can walk, hike, and bike the region. Pampaneira, Capileira, and Bubion are a string of three pretty villages in the region, and you can walk from one to the next, exploring each one. If you love photography, you will find much to keep your camera busy here, from the beautiful scenery to the cobblestone alleys in the little villages. Look for local flora and fauna, enjoy the medicinal spa waters at Lanjaron after a day hiking, and savor the cuisine made from fresh local ingredients. Trevelez, the highest village in the Alpujarras, makes an excellent base if you want to hike the Sierra Nevada or do the iconic trip to Las Siete Lagunas, a group of seven beautiful lakes. From any of the villages in the Alpujarras, you can do short walks into the hills. The Alpujarras can be reached from Granada by bus, or you can drive to the region. Wales has three National Parks, Snowdonia, Pembrokeshire Coast and Brecon Beacons. Each has its own delightful landscape and beauty, however Snowdonia is home to the tallest mountain in Wales. It’s one of the three mountains climbed in the UK’s 3 Day 3 Peaks Challenge. Snowdonia National Park itself is located in the North West of Wales and Mount Snowdon (Yr Wyddfa in Welsh) is at the top of the park near a town called Llanberis. Standing at 1,085 m (3,560 ft) high it is an exceptional day hike for nature lovers. You can choose from six formal tracks to the top, which range from a mild incline to steep and dangerous ridge climbs, but all tracks afford you a superb view out over Snowdonia. I recommend that you take Pyg Track up and Miners Track down. Although these two tracks are more difficult than the Llanberis Track, you will get beautiful views of the Lake Glaslyn and Llydaw. Believe it or not there is a cafe at the top of this mountain thanks to the railway that runs to the top from Llanberis. Mount Snowdon has been a tourist attraction since the 1800s and although some, including Sir Edmund Hillary (who trained on Snowdon before his attempt on Mount Everest), test their endurance on the mountain paths, others just come to enjoy the view via train. Either way on a clear day this is one of the best destinations in Europe for nature lovers. Serbia’s Lake Palic is located just ten kilometers from the Serbian border with Hungary and right outside the charming Art Nouveau city of Subtocia. This region of the country is known as Vojvodina, because it was historically controlled by the Austro-Hungarian empire. The lake itself is one of two in the area, both of which make for great day trips from Novi Sad or Subotica (or even from Belgrade). Serbian legend says that this made of tears. The shepherd boy Pavle lost his sheep. When he couldn’t find them, he sat down to cry. Its his tears that fill the lake, and that’s the reason that the lake is saltwater even though its far from the sea. Tourist activities at the lake include long nature walks, bird watching, and fishing. In the summer there is a film festival you can attend, or you can go for the wine festival in September. Other regional highlights include touring the Palic Wine Route, taking in the outdoor beauty of the local vineyards, along with some of their delicious local wines, of course! While this is one of the most visited places in Serbia, not too many people from outside the region come here, making it a true hidden-gem to the outside world. Whether you want to walk around the lake, enjoy fishing or swimming in it, or just sip local wine at sunset beside it, I highly recommend a visit here. The Achensee or Lake Achen in Tyrol, Austria is called the “Fjord of the Alps” and it’s easy to see why. Quaint lakeside villages, scenic hiking routes, a variety of water sports in summer, skiing in winter – that’s what makes Lake Achen one of the best destinations in Europe for nature lovers. 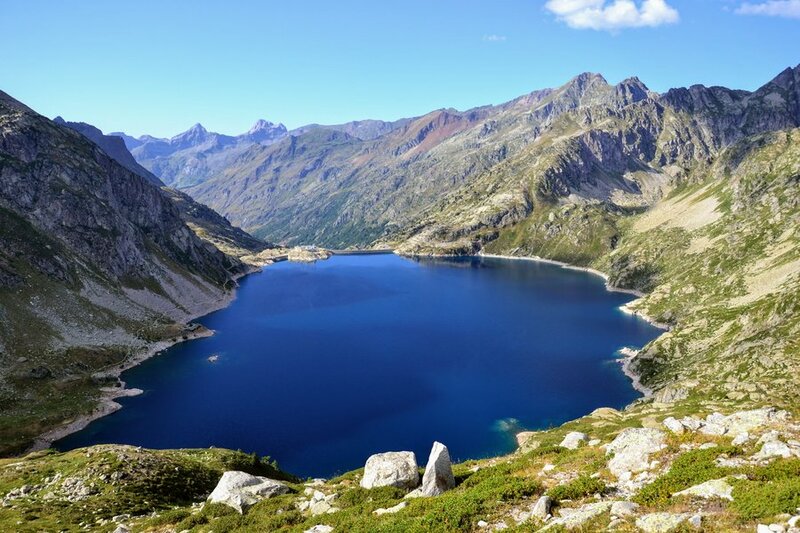 The Achensee is the largest Alpine lake in Tyrol, with a length of 9 km long. It’s 1,3 km at its widest point and up to 133 metres deep. The surrounding Karwendel Nature Park is home to Alpine marmots, chamois and Alpine ibexes. Nature lovers who want to explore Lake Achen can stay in three lakeside villages – Pertisau, Achenkirch, and Maurach. If hiking, mountain climbing, swimming, sailing or kitesurfing isn’t your thing in summer, you can play golf, go mountain biking or take a cable car to a paragliding adventure. Lounging in the sun and simply taking in the natural beauty around you is also an option! A great tip to combine easy hiking with a boat trip and traditional Austrian lunch, is to hike to the Gaisalm from either Pertisau or Achenkirch. This mountain restaurant is in a beautiful lakeside setting. The hike there takes about 2 to 3 hours, but the best part is that you can take a boat back to the start after a hearty meal. On rainy days, the Achensee Museumswelt in Maurach, with a selection of vintage tractors and hundreds of handmade dolls, provides alternative entertainment. Or you can find out how the healing Tyrolean shale oil is extracted from rocks in the area at the Tiroler Steinöl Vitalberg Erlebniszentrum in Pertisau. Lake Achen is only 40 km or a 40-minute drive from Innsbruck, the capital of Tyrol. If you are nature lover, then you know that nothing is more relaxing than a walk through the forest. Or taking a mountain hike, walk in the park, enjoying the majestic views of cliffs or the deep blue colours of the ocean. Basically just being out and connecting with nature. The environment has an astonishingly relaxing effect. Therefore, one of the best destinations in Europe for nature lovers is the island of Tenerife. There you can enjoy a stunning tour of the Reserva Ambiental de San Blas and stay at the nearby elegant Sandos San Blas Nature Resort and Golf. Located on Tenerife, one of the Gran Canary Islands, this Resort is definitely worth the flight ticket, especially since the Reserve is one of its main attractions. Besides, the flight tickets can hit bottom prices, especially during the off-peak months. Having to experience the environmental tour is possibly one of the best vacation ideas on the island of Tenerife. If you are bringing kids with you, you’ll also find that this is an impeccable educational experience for your children as they will be exposed to different types wild habitat and indigenous plants. You’ll be surrounded by picturesque cliffs and landscapes, giving you also plenty of photo opportunities. Amongst beautiful hills, you’ll also discover a little oasis. Basically, you’ll be able to walk in the wild on rugged terrain, so prepare to unleash your inner Indiana Jones. Altogether, it is also Europe’s best destination for nature lovers also because of the famous warn weather. One of the best destinations for nature lovers in Europe is Bulgaria, and more specifically, Rila National Park. About 1.5 hours out of the capital city, Sofia, you can find a beautiful hiking trail that takes you past seven glacial lakes - hence the name of the most famous hike in these mountains - the 7 Rila Lakes trail. You can start by taking a cable car up to 2100 meters, and then you can continue onwards, admiring all the lakes one at a time until you reach the summit at around 2600 meters. Each lake is a beautiful deep blue or green color and has unique shapes and names based on their shapes - the Eye, the Tear, the Kidney, etc. If you’re really interested in hiking, you can combine a few of Bulgaria’s best hikes into a 2 day hike, by extending your trip to also see the beautiful Skakavitsa Waterfall and ending at Rila Monastery, the most famous Orthodox monastery in Bulgaria and one of the most beautiful in the world. It’s also possible to camp overnight at the Rila Lakes if you want to catch sunrise or sunset and not have to worry about making it back to the cable car down the mountain at any specific time. If you’re feeling especially ambitious, Rila National Park is also home to the tallest mountain in the Balkan peninsula and Eastern Europe in general, Musala Peak. At 2925 meters, it’s quite a challenge, but it is definitely doable as a day hike! The Pyrenees Mountain chain located in the border area between Spain and France is a paradise for nature lovers. A 430 km-long stretch of pristine alpine landscapes offers an infinite variety of hiking opportunities. Our favorite national park for hiking in the Pyrenees is the beautiful section found in Aigüestortes i Estany de Sant Maurici National Park. In this area there’s a large diversity of colorful alpine lakes and varied landscapes from pine forests to steep peeks. There are hikes for all different kinds of people in the area. You can take for instance one of the trails around Estany de Sant Maurici, the largest lake in Aigüestortes. There are many smaller lakes, beautiful waterfalls and great viewpoints in this part of the park, relatively easily accessible for any excursionists. If you look for more challenge, you can try the Carros de Foc trail, a beautiful circular multi-day hike, usually done in 5 to 7 days, depending on your physical strength. You will go through some of most fascinating mountain passes and sleep in mountain refuges located in high up in the mountains. There are two main accesses to the park; one is from Espot at the Eastern end of the park or you can also get in from the Boí Valley in the West. There are 4WD taxis running during most of the year that take you to some of the most easily accessible points of the national park. The Rota Vicentina is a beautiful series of hikes through the South West of Portugal and through the regions of the Algarve and the Alentejo. Within the SW Alentejo and Vicentina Coastal Park, the hikes are fair to moderately challenging and certainly one of the top things to try in Portugal. There are two main trails that you can hike, the coastal Fisherman’s Trail and the inland Historical Way. Both are great for lovers of the outdoors as they allow you to see a completely different side of the south of Portugal and explore its beautiful landscapes. If you’re after the views, I would recommend doing the Fisherman’s trail, which winds its way up the country’s wild and rugged Atlantic coast. From huge sandstone bluffs to large areas of coastal dunes and some of the best beaches in Europe, there’s a lot to appeal to those who love to spend time outdoors and enjoy getting off-grid for a week. While it does go through some larger towns, much of the Fisherman’s Trail is through stretches of land that have been largely untouched and undeveloped. Alongside the hiking, this is also a great place to go surfing (there are lots of surf schools smattered along this stretch of the coast and even newbies can try and tackle the waves). Overall, the SW Alentejo and Vicentina Coastal Park contains some of Europe’s best coastlines and gorgeous views. I can’t think of a better reason to explore. Located in the Spanish Pyrenees just over the border with France, Benasque is a outdoor lover’s dream. Surrounded by the highest concentration of peaks over 3,000 meters in the Pyrenees, the tiny adventure town of 2,000 inhabitants lives for the outdoors. During the summer months, hike in the Posets-Maladeta Nature Reserve and catch a glimpse of the rapidly shrinking glacier on Pico Aneto, the highest mountain in the Pyrenees at 3,404 meters (11,168 ft). If mountain summits are too much for you, head out on one of the numerous hiking trails throughout the city and in the reserve. You can even hike into France! Other summer activities include mountain biking, trail running, kayaking, canyoning, rock climbing, mountaineering and more. Just about any outdoor activity you care to do, it’s in Benasque. In the winter, hit the slopes in Cerler, the highest ski resort in the Aragonese Pyrenees. Or, if you prefer cross-country skiing, head to Llanos del Hospital for spectacular mountain scenery. Finally, after all that outdoor activity, soothe your muscles with a visit to the thermal baths at Balneario Baños de Benasque spa where waters pour at 37°C. The town itself offers accommodation options for all budgets, including several camping locations for those who prefer to sleep outdoors. There are trails for all levels and abilities and the scenery is unbeatable. The Pindos National Park in Northern Greece is a mecca for nature lovers. 48 Quaint old villages lie dotted through the length of the valley, some perched high up on the mountain tops, while others are nestled way down below alongside the river. For hundreds of years the locals have been pretty much left to themselves due to the inaccessibility of the region, so the traditions and culture of the Zagori people have help strong. The highlight of the area is the Vikos Gorge, said to be the deepest gorge in the entire world! There are several spectacular viewpoints from which to appreciate the majesty of the gorge. Some are reachable on easy footpaths only a couple of meters long, while viewpoints like the Beloi Viewpoint near the village of Vradeto, is a good 1.5hr walk. The view will absolutely take your breath away so this is a definite must-do. If you are relatively fit and adventurous, the hike up the ancient serpentine path of Skala Vradeto will leave you with a sense of accomplishment and in need of a well-deserved beer. The village of Vradeto has 2 fabulous restaurants and a shop, but there are no longer any residents in the village. A beautiful aquamarine river runs through the valley and numerous aeons old arched stone bridges connect the ancient pathways that zigzag this stunning landscape. Stopping often is essential! The most popular village is Monodendri with the village of Kipoi down in the valley, close to some of the stone bridges. The roads are all sealed and in good condition but navigating the twisty turns up to Papingo villages should rather be left to the adventurous. If you’re looking for abundant nature and outdoor adventure in Europe, then you should seriously consider Tarifa, Spain. There is a great little town filled with whitewashed buildings, cobblestone streets, a castle and a fun, relaxed atmosphere. However, the main draw is its surroundings. There are so many things to do in Tarifa, it’s the perfect place for anyone who loves the outdoors. The town is bordered by both the Atlantic Ocean and Mediterranean Sea as well as two national parks. The town beach runs for miles with a promenade and boardwalk for the majority of its length. Runners, skateboarders and walkers alike can always be found enjoying it. Kiteboarding is undoubtedly the most popular sport in Tarifa, Spain with near constant winds. Surfing, snorkelling, scuba diving and even whale watching boat trips are readily available also. This is a great area for fishing as well and in particular it is known for tuna. Parque Natural del Estrecho runs along the coastline between Tarifa and Algeciras while the much larger Parque Natural los Alcornocales encompasses the mountains, rivers and canyons further inland. These protected areas provide excellent opportunities for a wide range of outdoor activities. Miles and miles of hiking and mountain biking trails can be found for everyone to enjoy. For those wanting a little more adrenaline, there are some great opportunities for rock climbing with a number of companies offering lessons and tours. Thanks to its position on the Strait of Gibraltar, Tarifa is in the migration path of many birds as they make their bi-annual flight between Europe and Africa. This makes it a perfect area for birdwatching with sightings of over 400 species of birds possible. Head to the Laguna de los Lances west of town or the Mirador del Estrecho in the opposite direction for the best locations. No matter what type of outdoor adventures you are looking for, Tarifa will have something for you.